Organizers expect the static display at this year's event to host 47 aircraft, the same as last year. 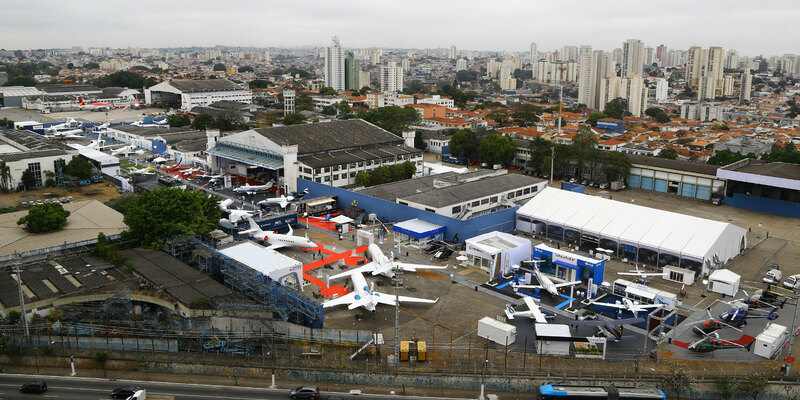 LABACE organizers offered guarded optimism for business aviation in Brazil as they gave a preview of Latin America's largest business aviation fair, opening Tuesday at Congonhas Airport in São Paulo. “We hit the low point in 2016, and it's not good now, but it's improving,” said Leonardo Fiuza, chairman of LABACE organizer ABAG (the Brazilian association for general aviation), emphasizing recovery of both the fleet and operations. But Fiuza added, “business aviation reflects business,” and the recovery is still fragile: at the start of 2018, economic growth of 4 percent was expected, but that dropped to 1.5 percent after a national truckers' strike in May. Upcoming presidential elections are also a big unknown, he said. Even so, attendance is expected to increase at LABACE 2018, as Brazil remains the world's second largest general aviation market. This year's event is expected to host 47 aircraft, about the same as last year, with Embraer bringing its entire lineup and Cirrus bringing the Vision Jet for its first public showing in Brazil. Avic Harbin is not bringing an airplane, but will have a booth to highlight its Y12E and Y12F, with certification still pending in Brazil. ABAG CEO Flavio Pires explained that despite the physical shift in the space used at Congonhas Airport, the area for aircraft and exhibitors remains the same. Exhibitors once again will occupy the historic hangar, with the static display area shifted away from the avenue. “But the display will still be cozy,” Pires promised. The auditorium is now located beside the exhibits and static display, and will feature a lineup of speakers “in the style of NBAA and in line with the goals in ABAG's charter,” he added. While the static display and exhibition hangar will be open from 12 p.m. to 9 p.m. (8 p.m. on the last day), the auditorium program will start at 10 a.m. On Wednesday and Thursday morning one stage will be dedicated to the medevac market that is emerging in Brazil. Piracy in aviation will be a theme of the first day, encompassing not only gray-market charters but also uncertified repair facilities, parts, and importation. Brazil's top aviation official, Secretary of Civil Aviation Dario Lopes, will discuss long-term goals for the country's general aviation. Embraer founder Ozires Silva will be the keynote speaker at the opening session on Tuesday morning. The aircraft start rolling into the static display at 2 p.m. today.